Contributor: Classical Numismatic Group, Inc.
Issuer: Anonymous. Circa 4th-3rd Century BC. AE Unit of 3 Unciae? (56.82 gm). Reference: G. Fallani, "Rilievi ed osservazioni su alcune monete della serie dell'aes grave" in Numismatics - Witness to History, IAPN Publication no. 8, pl. 6, 2b/c. Grade: gVF. Comments: CNG comments: "only 11 specimens specimens known to Fallani." Issuer: Anonymous. 241-235 BC. Aes Litra (3.32 gm). Obverse: Helmeted head of Mars right. Reverse: Horse's head right, strigel/sickle behind, ROMA below. Reference: Crawford 25/3; Sydenham 26; BMCRR (Romano-Campanian) 64. Grade: EF/gVF. Issuer: AR Didrachm. Anonymous, ca 225-212 BC. Obverse: Laureate Janiform head of Dioscuri (Castor and Pollux). Reverse: Jupiter right in quadriga driven by Victory. Jupiter holds scepter in left hand and hurls thunderbolt with right. ROMA in raised letters on tablet below. Reference: Crawford 30/ -34/; Sear 80. Grade: VF. Issuer: Anonymous. Circa 240-225 BC. Aes Grave Triens (84.05 gm). Obverse: Helmeted head of Minerva left, four pellets below. Reverse: Prow of galley right, four pellets below. Reference: Crawford 35/3a; Thurlow-Vecchi 53. Grade: VF. Issuer: Anonymous. Circa 225-217 BC. Aes Grave Quadrans (62.41 gm). 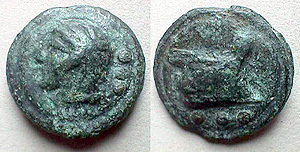 Obverse: Head of Hercules wearing lion's skin headdress left, three pellets behind. Reverse: Ship's prow right, three pellets below. Reference: Crawford 35/4; Thurlow-Vecchi 54, pl. 35, 54; Haeberlin pl. 18, 1-9. Grade: gVF. Issuer: Anonymous. Circa 225-217 BC. Aes Grave Quadrans (69.17 gm). Obverse: Head of Hercules left wearing lion's skin, on raised disk, three pellets behind. Reverse: Prow of galley right on raised disk, three pellets below. Reference: Crawford 35/4; Thurlow-Vecchi 54; Haeberlin pl. 18, 1-9. Grade: VF. Reverse: Prow right, 3 pellets below. Reference: Crawford 35/4; Thurlow-Vecchi 54. Grade: F.
Reverse: Prow right, pellet below. Reference: Crawford 35/6; Thurlow-Vecchi 56. Grade G/F. Issuer: Anonymous. 217-215 BC. Aes Uncia (12.22 gm). Reverse: Prow of galley right, ROMA above, pellet below. Reference: Crawford 38/6; Sydenham 86; BMCRR 88. Grade: VF. Issuer: Anonymous , 217-215 BC, AE Uncia. 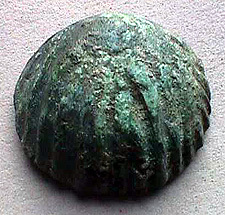 Reverse: Prow, ROMA above, single pellet below. Reference: Crawford 38/6; Wulfing 30. Grade: aVF.